Muskrat wrote: An album is an album (for the sake of argument, a disc containing more tracks than there are on a single). 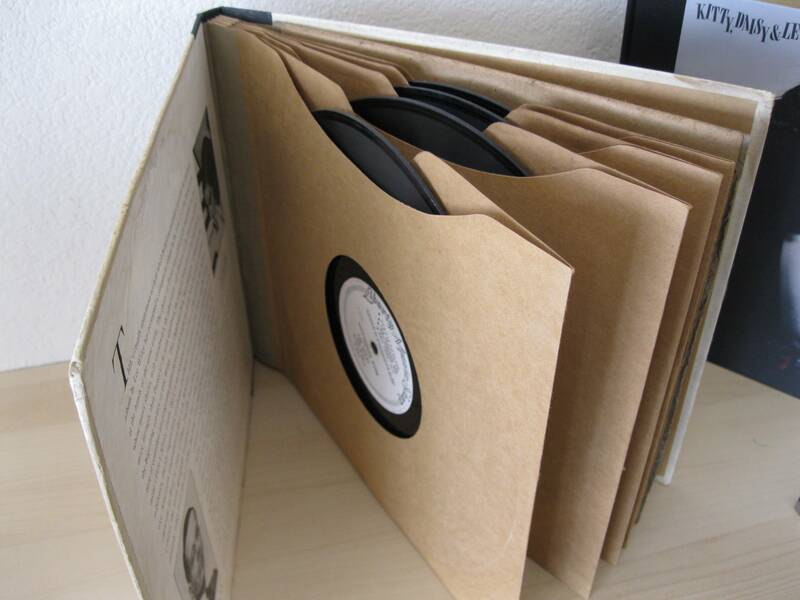 Got the name because they were originlly book-like folders containing a number of 78 rpm singles. In that sense, a hits collection is as much an album as, say, Sgt. Pepper. I've got to be honest, i've never really thought about Elvis too much in terms of albums. That's not to say he hasn't had quite a number of good-excellent albums of his own, (The two 1956 albums, King Creole, Elvis Is Back, Elvis From Memphis, TTWIS ect.) more that I tend to think of his output as sessions, or eras of particular material. Elvis/Colonel/RCA weren't really in the business of making albums, for the most part, they were making product. So much of his releases pre-80s tend to be more like grab bags of material then satisfying records that the Rock acts that came after him were creating. Hell, even his first album, Elvis Presley (LP-1254) uses a few Sun outtakes which makes it a less consistent collection than a compilation of his 1956 material . One of the great things about Elvis, is that even though as an album artist he was pretty damn inconsistent (especially with all those mid-60s soundtracks) he has great stuff in almost every year of his career. 1954-1961 and 1968-1971 in particular was where he could, and sometimes did (depending on how inspired he was or the material he was given) record some great albums. Even in his leaner years like 1966-1967 he still had a number of good songs like Guitar Man, Tomorrow Is A Long Time, I'll Remember You ect. If he'd have had more of a role in controlling the way his albums were compiled his comeback could have started a lot sooner. There's probably at least a dozen + lost opportunities for great albums that were missed due to RCA and the Colonel trying to squeeze every drop song material out of Elvis by spreading it too thin, resulting in many records just becoming a hodgepodge. The FTD label and even Sony in recent years have found a much better way of presenting his finer material, which in his lifetime often didn't do him justice. His final recordings as collected on The Jungle Room sessions makes for a more satisfying listen then say.. Moody Blue, Which was put together from scraps of material basically, and includes Live recordings from the period to pad it out. His Stax sessions in 1973 were kind of mixed, but had a fair amount of good material, RCA squeezed it out and made three fairly mediocre albums, 1973's Raised On Rock, 1974's Good Times, and 1975's Promised Land. If they'd have made one or two albums tops out of the best material, they'd have probably been looked back on a lot more fondly. As it is, they became largely forgotten even amongst many fans until RCA released a 'Elvis At Stax' box set a few years ago. Overall Elvis had 24 studio albums, 18 soundtracks, 9 Live Albums, countless E.Ps and Single only releases in his lifetime. If there was a form of quality control, (and less albums featuring substandard material) we could be looking at one of the best discography's for any artist. As it is, and Elvis being as mismanaged as he was, half the albums released in his lifetime contain a lot of crap that no one outside of the diehards would ever listen to these days. The complete 50s box and the 60s and 70s boxes highlighting his best material from those decades are generally some of the better ways to listen to Elvis, they do a good job of separating the wheat from the chaff, yet there's about 300-400 songs there, most of it is between good to excellent. Despite the ups and downs there is a wealth of material from 1954-1977 worth listening to, if it was presented in a more accessible way from the start, the dismissive attitude towards Elvis might not have become so prevalent. The presentation of his albums is just one of the many 'what-ifs' about his life and career. Last edited by NowhereMan on 05 Nov 2018, 00:09, edited 2 times in total. Except we weren’t talking opinions here, we were talking Facts. The vast majority of those songs had been previously released. Of course we all know that an album can be a compilation. But when Googa started the thread he clearly meant an album in the traditional sense of that word. And I will clearly admit that I’m wrong when in fact I am Tom. Plase note that the long player in question is called "The Sun Sessions", implying that it is a comp. Also note that the music presented on it appeared on numerous collections over the years, with different titles and covers. Not what you'd get with a preconsidered studio album, is it now. The one thing they share is the material, often in its entirety, and the name "Sun" appearing somewhere in the title. In all my years of fandom and collecting and reading about music, I have never heard or read mention of Sun Sessions being an album. Before now.